I'm thrilled to introduce this month's timely Sewing 101 post. Please welcome Katy of No Big Dill fame! Hello, Pickup Readers! I am delighted to be here to talk a bit about my sewing passion. This is such a great series to help demystify some of those techniques you frequently see, but not explained. When Chris asked me to guest post last month, I knew I wanted to talk about double needles. Double needles might look intimidating, but they are so versatile and helpful, especially if you don't have a serger, but still want that professional looking finish. 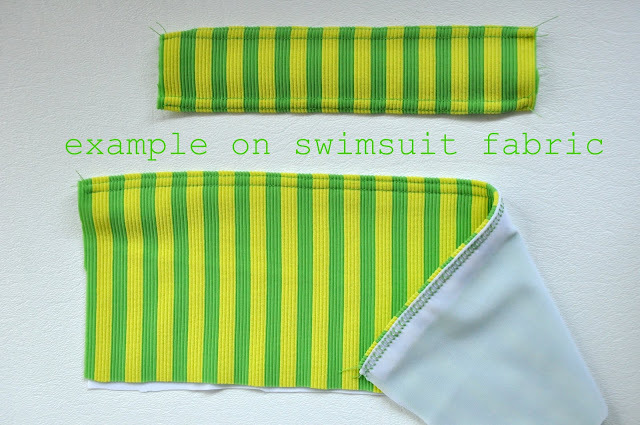 So, today I will just be going over one use of the double needle that I frequently utilize in my sewing of swimsuits for my girls. 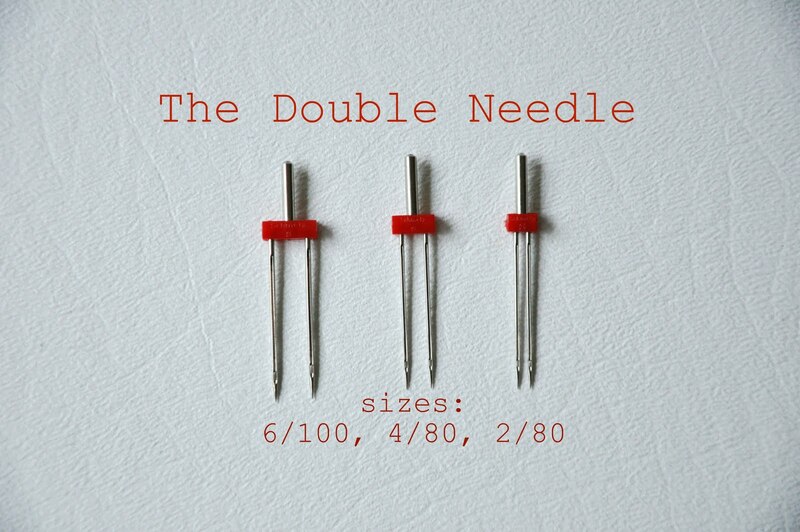 There are several different sizes of double needles as well as types, such as stretch and denim. I use the regular double needles and prefer the 4/80 size for most of my projects, but you can order the others online. The double needle is flat on the back above the red bar, just like regular needles and goes in the same way as a conventional needle does, with the flat part facing the back as you slide it up and tighten the screw to hold it in. 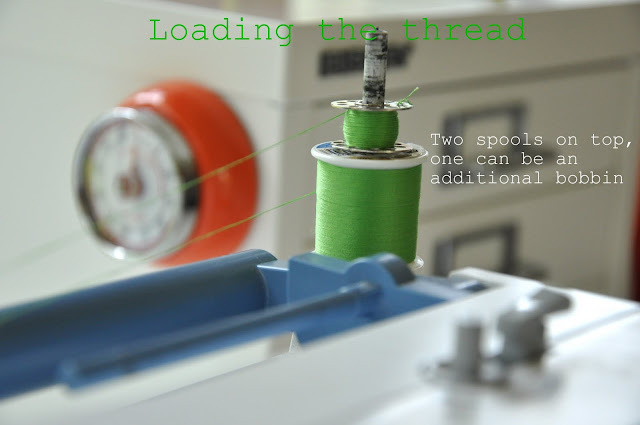 You will load the top of your machine with two spools of thread. If you don't have the same color, just load an additional bobbin and stack on top of the other, making sure they are unwinding the same direction. Load them both through the top of your machine together, just as if it were a single thread. 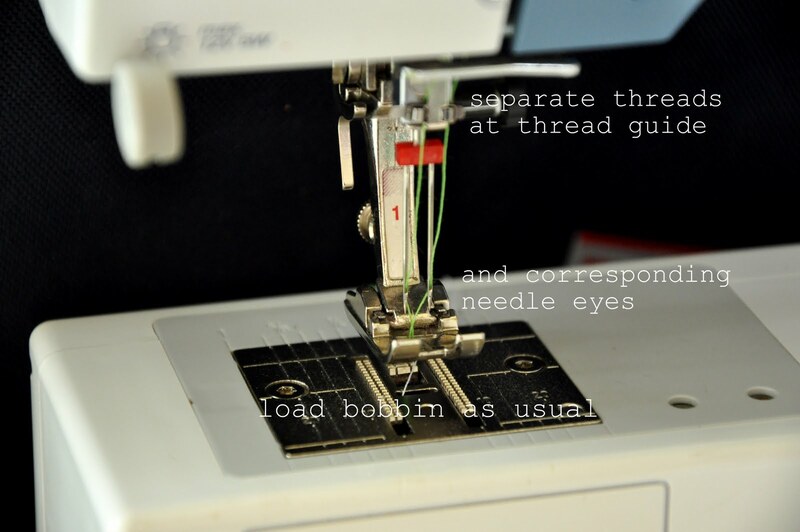 Once you get to the thread guide just above the needle, you separate the threads on either side and bring them down to the two needles in corresponding positions. The bobbin with thread as normal, just one! Increase your stitch to a 3, as that gives it a more professional look. You will stitch your fabric without stretching it and only on the right side of your fabric. The back does not look the same! 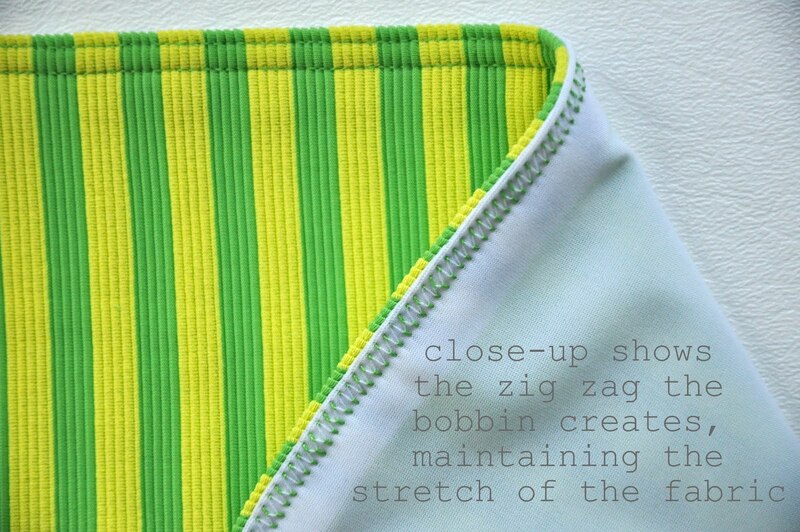 In fact, the zig zag that the bobbin thread creates on the back is what helps maintain the stretch-ability of the fabric, while the front looks professional and tidy! It's that easy! Thank you so much Katy for demystifying double needles! I recently acquired a few in a steal on ebay, but was a bit intimidated. Please be sure to check Katy's blog for her swimsuit tutorial. While you're there, be sure to read through her amazing Once Upon a Thread series. You want to know how I found Katy's blog? This amazing ruched headband! Wow! this post amazing. I have never used a double needle before. The look is fantastic. This opens up a world of possibilities. Thank you Katy and Chris! I have never used a double needle and wasn't sure when I should but now I want to try it out. Awesome, awesome! I need a bunch of these stat. I LOVE using a twin needle!! And reading your description above, I'm realizing it's like the mullet of the machine stitches - all business on the top, rock 'n roll on the back. Ha! So, kinda like a serger but without a serger? I'm in! Thanks so much! I had no idea what double needles were for. Wonderful!! I HATE my serger and this is the perfect fix! Thank you!! This is fantastic. I've never used a double needle before or had any idea what to do with one. Thanks! Thanks for this Chris and Katy! I've never used the double needle and was always petrified to. Maybe I won't be so scared of it now and give it a go. Thanks for the encouragement! I had no idea double needles could be so easy! I can't wait to try this! Awesome. I feel silly asking this but can you use these on a regular sewing machine?! I assume that it's a regular sewing machine in the photo but it almost seems too good to be true. @Marisa It's such a polished finish like a serger. Awesome explanation! I haven't worked with knots because I thought it would be better to use a server, but now I will try the double needle. How can you sew around a 90 degree corner? @sewnsewIt's tricky with a double needle. My best advice is to carefully lift your needle, turn your fabric the angle required, and then set your needles down with the outside one in the outside stitchline. I hope that helps! when you say "set your machine to a 3" do you mean stitch length or tension? when you say set the machine at 3. do you mean thread tension or thread length?